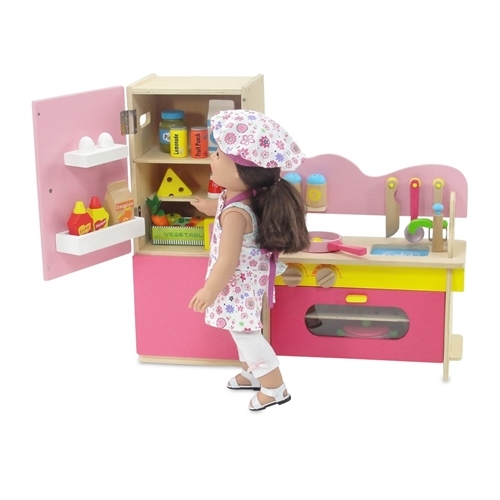 Your 18-inch doll throws some amazing parties and imagination-filled get-togethers with this kitchen VALUE set combo, including an amazing oven/sink/stove kitchenette and perfectly sized refrigerator/freezer! All of her friends enjoy the healthy food and sweet treats she serves, which can now be stored in this fantastic, must-have doll refrigerator and freezer combo. 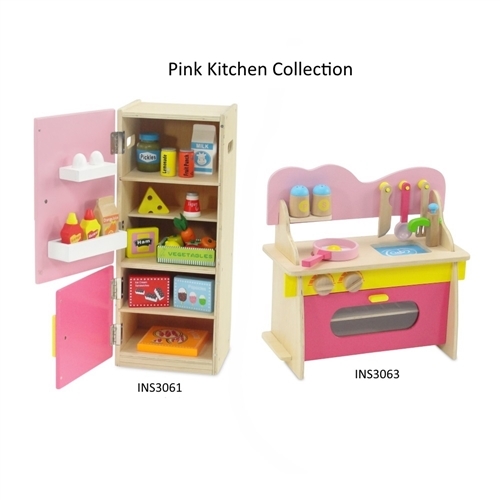 This sturdy, realistic, wooden appliance features brightly-colored, two-tone pink refrigerator and freezer doors with multiple shelves for goodies of all sizes. Inside, your American Girl doll will find 20 beautiful and carefully painted wooden food items and a colorful cardboard produce tray, all included. But that's not all, we have also included a matching kitchen set! 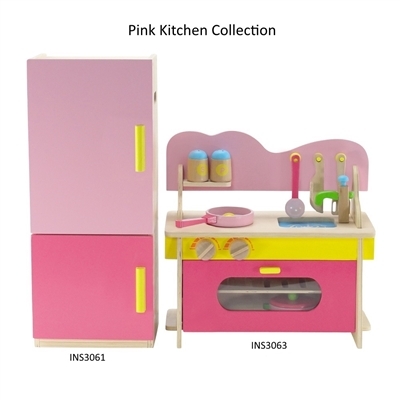 Get cookin' with this bright, pink-themed kitchenette with stove top appliance, sink, and oven. The oven includes temperature dials that click when turned. 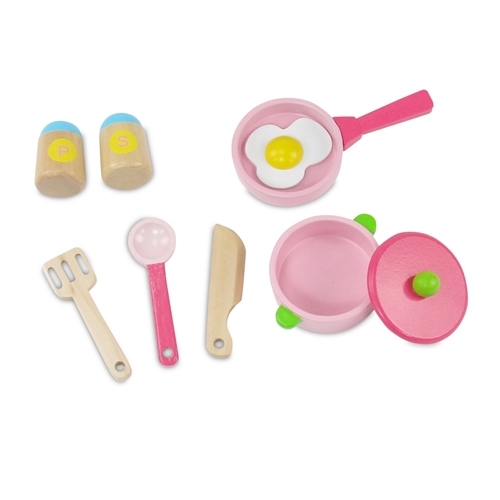 What's better is that this colorful kitchen includes a painted, wooden pan, pink pot with lid, cooking spatula, spoon, knife, and fried egg. As an added bonus, your doll will be able to spice things up with salt and pepper shakers that make noise when you "shake" them! You and your friends are going to have endless amounts of awesome fun cooking up new recipes for your dolls to eat. The best part is that these wooden appliances are designed to be easy to assemble. Dimensions provided are based on the fully assembled product. Brightly colored wood refrigerator/ freezer and kitchenette are painted a beautiful 2-toned pink with real opening and closing doors and multiple shelves to store all of your food and real clicking temperature dials! Beautifully realistic, the fun fridge/freezer accessory includes 20 pieces of painted wooden food items plus a colorful cardboard produce tray and the doll kitchen set includes colorful wooden food and utensil accessories: Pot with lid, pan, spatula, spoon, knife, salt and pepper shakers, and fried egg..
Refrigerator and freezer combo measures 19 1/4" x 8 1/8" x 7 and fully assembled Kitchen Set measures 14 1/8" x 14" x 6 3/4".